Which Traffic and No Trespassing Signs Work Best? Blog > Which Traffic and No Trespassing Signs Work Best? A picture may be worth a thousand words, but sometimes images without words need further clarification. Alternately, words standing alone on a sign without any context or background can also cause confusion and make people wonder what the sign is really all about. Consider the pictorial-only “No Dogs, Skateboarding, Smoking or Alcohol” sign. Without any text, the no smoking sign is almost comical. It is unclear what it really means. Does it indicate, “Dogs riding skateboards are not allowed to smoke or drink a glass of wine?” It is likely to give viewers pause but not for the right reasons. Signs that confuse people or make them chuckle are far less likely to be taken seriously. The text-only no trespassing sign, while less fun and entertaining is certainly clearer. 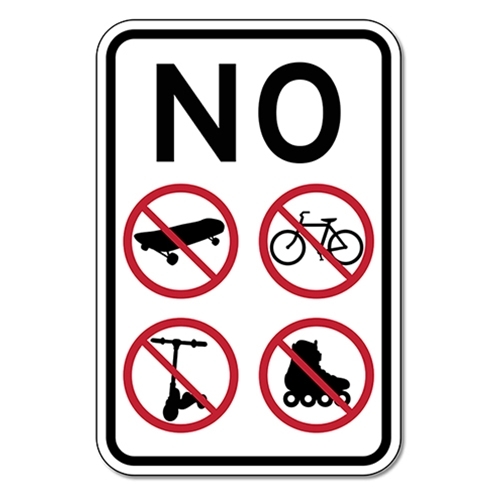 This common private property sign is more intimidating and leaves no room for dispute regarding which activities are banned. A sign using images and text such as this private property sign that uses the familiar circle with slash to show forbidden activities might be better yet. Other types of no trespassing signs are most effective when text is paired with a strong, attention-getting image. Look at the image-free “Beware of Dog” no trespassing sign. Sure the text is clear but it is boring, dull, predictable and unlikely to really capture a viewer’s attention. Now put together a picture of a vicious barking dog with “Guard Dogs on Duty, No Trespassing” text and the impact is far more effective and impactful. Other types of signs such as warning traffic signs can change overtime in order to improve sign consistency across the board. Take the familiar “Stop Ahead” signs, which warn drivers of upcoming stop signs. Such warning signage is typically posted on roads where drivers may need advanced notification to prepare themselves to stop. 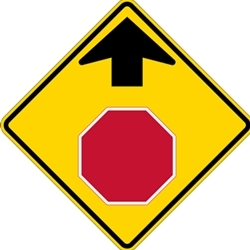 The text-only yellow warning signs are being phased out by the MUTCD in favor of the visual-only Stop Ahead signs, which show a red stop sign with an arrow pointing “ahead” on top of it. This move supports the effort by the Federal Highway Administration to have all such traffic warning signs, including yield ahead, reduced speed ahead and others, to use this image pattern in the future.